Researchers at Kyoto University in Japan have found that bottlenose dolphins seem to perceive the visual world much like chimpanzees and humans do, even though the mammalian species are adapted for life in vastly different environments. 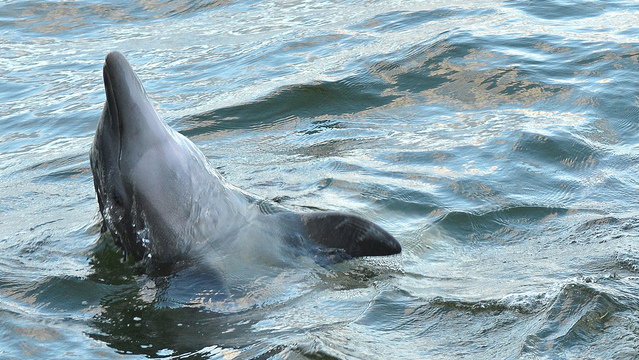 In a Scientific Reports paper published today (January 16), Masaki Tomonaga and his colleagues show that dolphins exhibited similar abilities to both primates in a visual-matching task. The researchers tested dolphins, chimps, and human volunteers on comparable visual-matching tasks, then analyzed error patterns to determine how each subject perceived visual stimuli. They found that all three species perceived shapes similarly, but with some variation. For example, dolphins and chimps relied more on acute angles for perceptual classifications, whereas humans used curvature. “The reasons for these differences in visual perception remain unclear at this point,” Tomonaga and colleagues wrote. “Based on an understanding of the fundamental similarities and possible differences in the visual perception of dolphins and that of other species, we can examine the cetacean mind in greater detail,” they added. WIKIMEDIA, TONY HISGETTIn an effort to better understand how falcons pursue their prey, physicist Suzanne Amador Kane and her undergraduate student Marjon Zamani analyzed the target’s position on each frame of films captured by cameras strapped to the raptor’s head. “They look like they're wearing the kinds of helmets that fighter pilots used to wear,” Kane told The Guardian. Publishing in The Journal of Experimental Biology this week (January 15), Kane and Zamani showed that in both video footage and simulations falcons fix the prey in their sights and then maneuver to keep the target’s image motionless against the background, finally sneaking down for a swift capture. 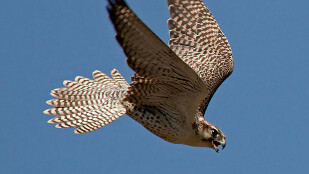 The authors noted that this approach helps the falcon home in on unassuming prey with its central visual field. “Think about chasing a toddler around in the playground: they keep zigging and zagging away from you . . . so you just have to head them off,” Amador Kane said, comparing how falcons pursue their prey, in a statement. 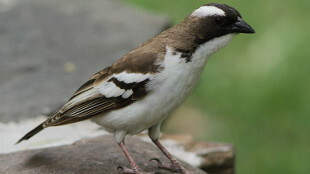 WIKIMEDIA, VALENTINAScientists at the University of Exeter and the University of Bristol this week (January 15) showed in Biology Letters that the Earth’s lunar cycle can affect the dawn song of the white-browed sparrow weaver (Plocepasser mahali), a cooperative songbird that’s active during the day and sleeps at night. While it’s well-known that the behaviors of nocturnal animals can vary with moon phase, Exeter’s Jennifer York and her colleagues noted that the lunar cycle’s effects on diurnal creatures like the sparrow weaver have been less studied. The team found that when the moon was visible at dawn, male white-browned sparrow wearers began to sing an average of 10 minutes earlier if it was full versus a new moon. The full moon also correlated with longer performance periods and greater overall song output, the researchers found, noting that this phenomenon could extend to other species. “Effects of the lunar cycle on twilight signaling behavior have implications for both pure and applied animal communication research,” York and her colleagues concluded. 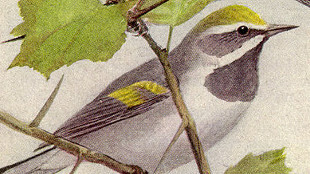 WIKIMEDIA, LOUIS AGASSIZ FUERTESFemale golden-winged warblers must weigh the pressures of nest success and fledgling survival when choosing where to raise their young, according to research led by investigators at the University of Minnesota. Because the songbirds can impact nest success based on where they choose to set up shop but only have one shot at fledgling survival once settled, they must “balance opposing selection pressures to maximize total fitness,” wildlife ecologist Henry Streby and colleagues wrote in a Proceedings of the Royal Society B paper published this month (January 8). Streby’s team found that the female warblers would switch from high- to low-risk nest-site choices based on the time remaining for additional nesting attempts. The researchers likened this change in behavior among birds to how humans tend to invest more conservatively as they approach retirement. Sprague-Dawley ratWIKIMEDIA, JEAN-ETIENNE MINH-DUY POIRRIERRats are more likely to help previous cagemates and animals of the same strain than strangers, according to study published in eLife this week (January 14). 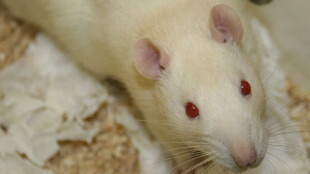 In it, scientists from the University of Chicago also showed that this helpfulness could be attributed more to nurture than to nature—rats that were fostered from birth by another strain would help strangers from the fostering strain, but did not help strangers of their own strain as adults, suggesting that familiarity is a prerequisite for pro-social behavior in the rodents. “Rats choose to help according to which rats they’ve had a positive social experience with in the past,” study coauthor Inbal Ben-Ami Bartal told The Washington Post.